After a few days in Melbourne doing family stuff (a big smile) and a bit of shopping, Colin and I drove north. Not to Queensland (which is where Johanna is spending the holidays) but six hours or so to the very North West tip of Victoria - Mildura. Colin had some work meetings here and I came along for the ride. Neither of us have been to this part of the country before. Hour upon hour of Aussie bush and farmland interspersed by country towns in varying states of decline. There is something sad about main streets with boarded up shop fronts, telling a story of a time when things were different and hope survived. We passed golden fields of canola and then a 100km of wheat dominating the Mallee. 30km south of Mildura the wheat ends abruptly to be replaced by grape vines, one paddock holds the last of the wheat and literally next door is the beginning of the vines. 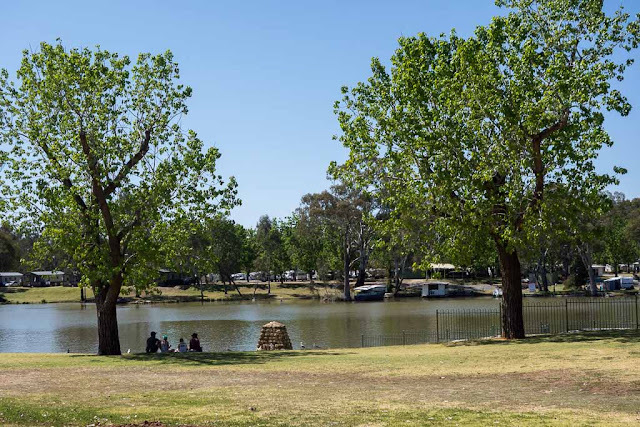 Mildura sits alongside the Murray and a short walk from our apartment takes me to its banks. 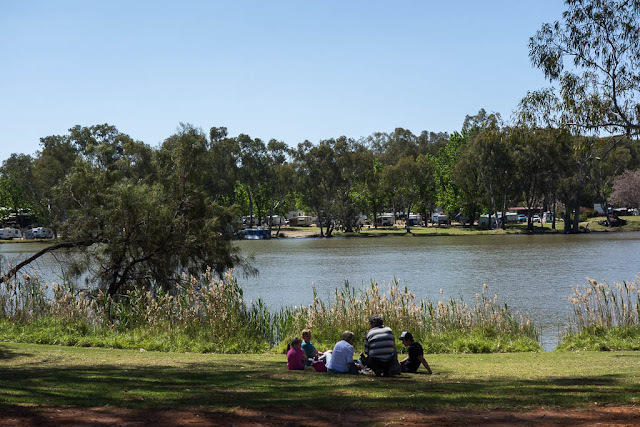 There are parks and playgrounds, a local art gallery, a walking track, a caravan park on the other side and house boats moored along the edges. I spent a lazy afternoon walking and chatting to the ladies in the art gallery and reading a book under the shade of a tree. I shared the river edge with people fishing, kids feeding the ducks, teenagers splashing water at each other and sun baskers and sleepers laying on rugs. Our apartment is also a stones throw from the main shopping strip. I had my lunch sitting in the mall today and later in the afternoon ate ice-cream there too. 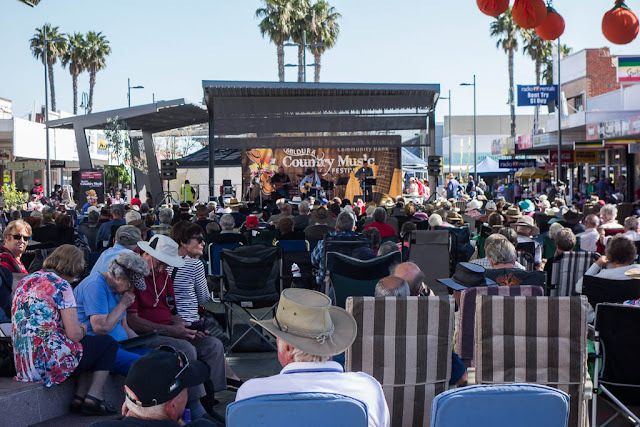 I shared the mall with hundreds of retirees all in town for the Mildura Country Music Festival! It is a sea of grey hair, beneath sun hats and other kinds of hats too - spotted quite a few acubra's. 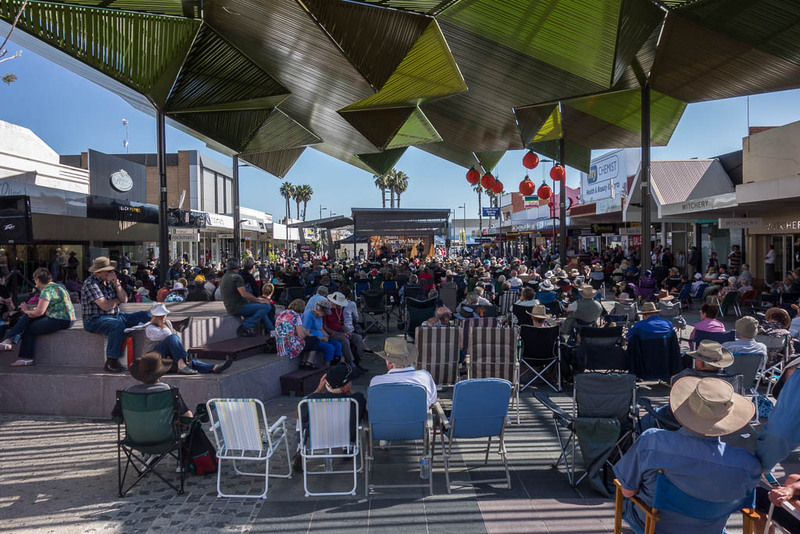 I don't think I saw anyone under 60, just lots of 'old people' with fold up chairs. This is one time when having a walker is a bonus, a mobile seat, ready anywhere any time. The musicians are of a similar age, seasoned veterans of the country music scene. There is something pleasant though about watching people enjoying themselves, relaxed and happy. It gives me hope (and makes me smile) when I see older people still enjoying life, travelling and pursuing passions and interests. There has been a spot of yodelling and occasionally a brave couple gets up and has a dance. There is line dancing at a different venue and I found out the musicians perform in different locations around Mildura, including a caravan park and an aged care home. 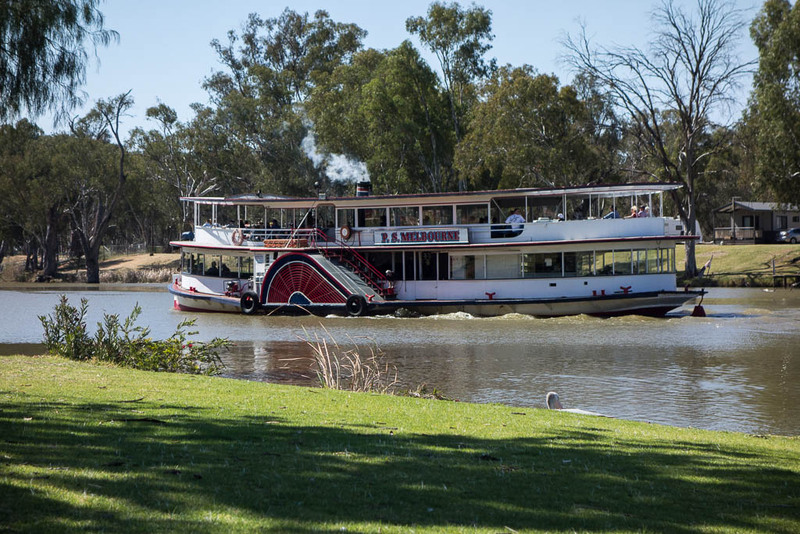 I heard someone performing on this paddle steamer as it left for an afternoon cruise.